I enjoy making various types of pizza crusts, rather than just buying premade ones. It’s hard to find gluten free ones that are also vegan anyways. The other day I came across this one that was made out of quinoa. 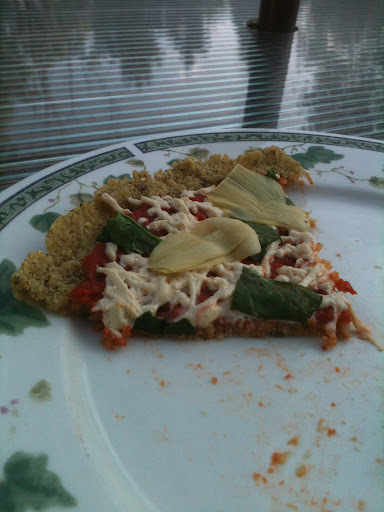 Since I love quinoa, I thought this crust would be a great alternative to the regular pizza crust. I cannot remember where I saw the original recipe, but as soon as I do I’ll link it on here. Cook the quinoa in the vegetable broth until it absorbs the liquid (about 15minutes). Allow to cool slightly. Combine the cooked quinoa with garlic and salt in a food processor. Blend until it starts to stick together. Transfer to a bowl and stir in the flax egg. Pour the mixture into a greased pan. Squish the dough down so it is thin and sticks together. Preheat oven to 400F. Cook for 10 minutes. Turn the oven down to 350F and continue to cook 15-20 more minutes. Take out the crust, put on sauce, cheese, and any additional toppings. Cook for another 5-8 minutes. This crust was tasty, but it didn’t hold together that well for pizza. I had to eat this with a fork since it was so soft, and not crispy at all (except the crust). 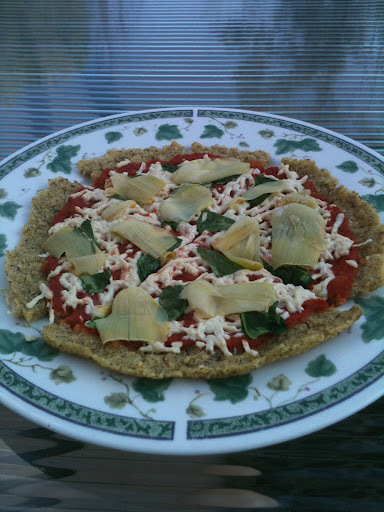 Even though this was a “pizza”, I felt like I was eating my typical meal of mixing veggies with some quinoa and pasta sauce only without adding beans but adding cheese and baking it. So even though this was good, it was more of like a baked quinoa dish. 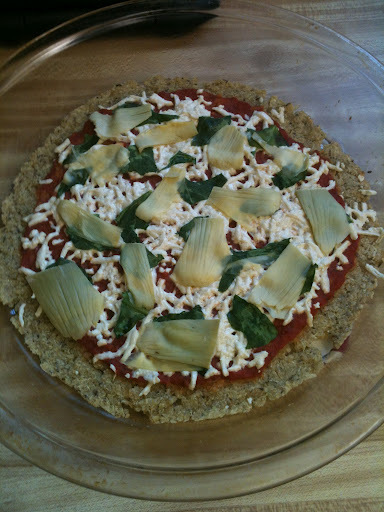 I added spinach leaves and artichoke hearts to my pizza! 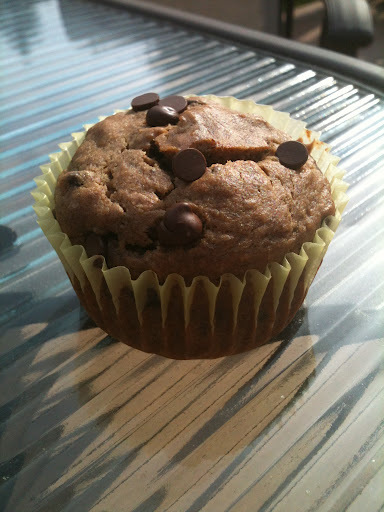 I have been wanting to make a muffin with banana and peanut butter for a while, I love those two together. I came across this recipe on pinterest, and realized I could easily veganize it and it was already gluten free! Even though the recipe calls for almond butter, I was going to use peanut butter, since like I said I love that combination. But then I started reading about almond butter and found that it has a lot of healthy nutrients and obviously almonds are a much heart healthier nut than peanuts. I wanted to try almond butter anyways so bought some and that stuff is incredible! In a mixing bowl, combine all ingredients except chocolate chips. Mix everything together. Stir chocolate chips into batter. Pour batter into prepared muffin tin. 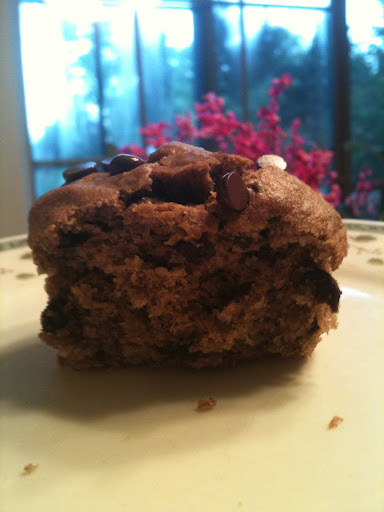 Top muffins with a few additional chocolate chips. 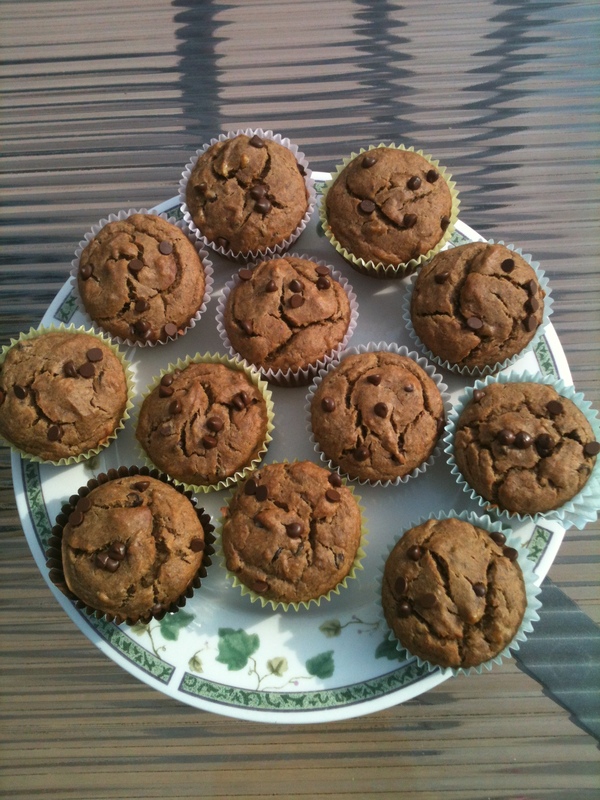 Even though these muffins would be good with peanut butter, I really enjoyed the almond butter! Maybe next time I’ll try with peanut butter though. 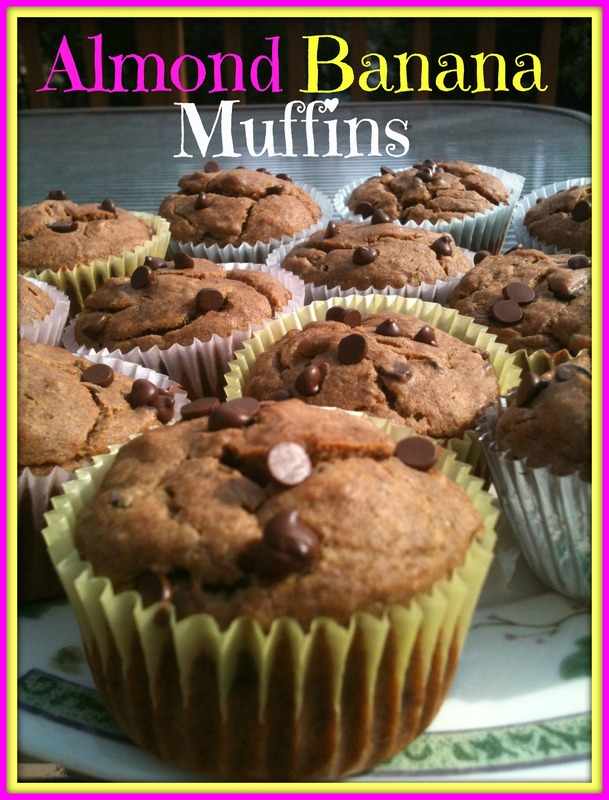 These muffins are great for breakfast, as a snack, or as a special treat after dinner! Mix together all other ingredients to create the marinade. 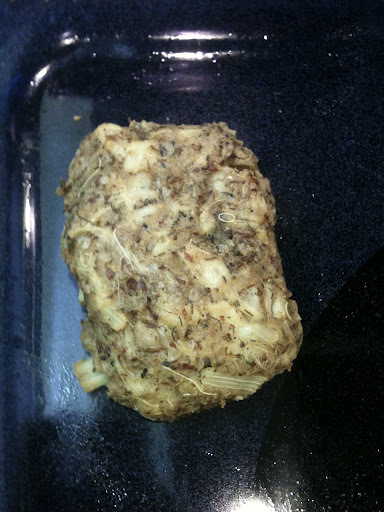 Place tofu onto a greased baking sheet. Spoon some of the marinade on top of each slice of tofu. Bake at 450F for 15-18 minutes. 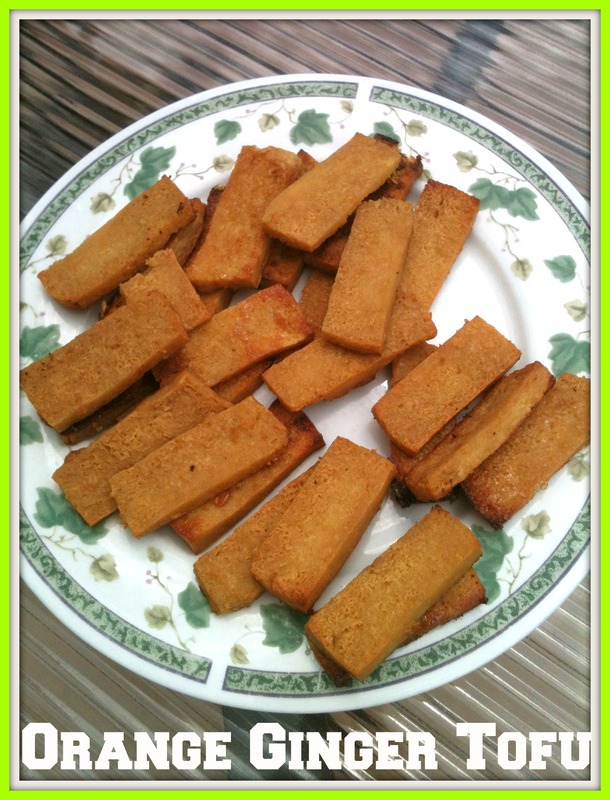 Flip tofu over, spoon some more marinade on top of each slice of tofu, and continue to bake for 3-8 minutes. I baked these for both the longer amounts and the tofu came out very well done. Just be careful that they don’t burn, they do continue to cook as they cool. If you don’t like soft tofu, I recommend baking it for the longer amounts. (And maybe even a little extra, depending on your preference. Just make sure it doesn’t burn!) My family loved the texture of the tofu and said it was their favorite I’ve ever made. As I bit into the tofu, I could taste the juices flowing out; it was heaven! These are great alone, or I chopped them into smaller pieces and threw them in a salad. 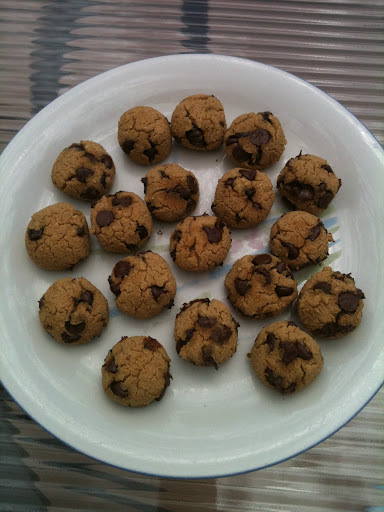 I was in the mood for some cookies today and wanted to try these protein cookies; they seemed like a great way to get my protein for the day! 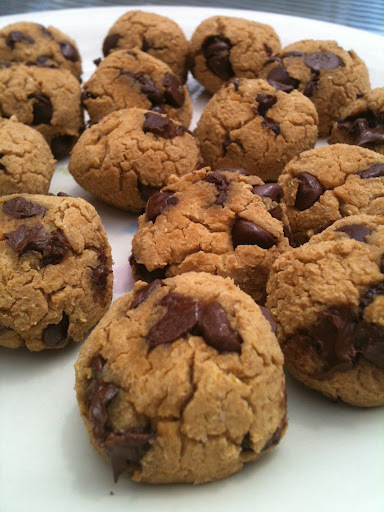 They are very similar to these Peanut Butter Chocolate Chip Cookies except they don’t use peanut butter but protein powder as the main protein source. I made a few changes to the original recipe, which is adapted from here. In a food processor, blend chickpeas. Add water, protein powder, agave and vanilla (if using) and blend until dough forms. Form into 1-inch balls and place on cookie sheet. Bake for 15 minutes. 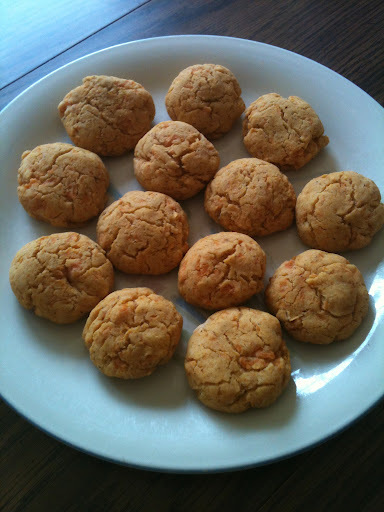 These were super tasty and easy to make, and since their made with chickpeas and have SO much protein powder, these are definitely a no guilt cookie! I will be making these again sometime very soon. 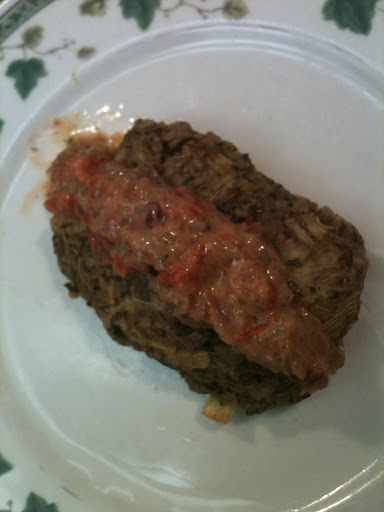 Well, shortly after I was at Great Sage, a blogger I follow reviewed this particular meal when she had it at Great Sage. She then recreated the meal at home! They have the same ingredients as the “crab” cakes from Great Sage. 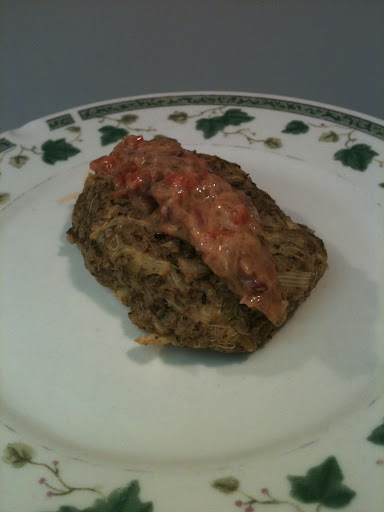 I immediately knew I’d be making these “Crab” Cakes for myself! Preheat oven to 400F and coat a glass baking dish with non-stick spray. Divid the mixture into 4 equal parts and shape them into balls, then gently flatten them. Bake for 25-30 minutes, or until golden brown. Flip them halfway through baking time. * Note: I had the hardest time finding breadcrumbs. All the gluten free brands had egg whites or milk listed in the ingredients so I decided to make my own breadcrumbs out of crackers by putting them in a gallon-sized ziploc bag and using a roll pin to crush them. 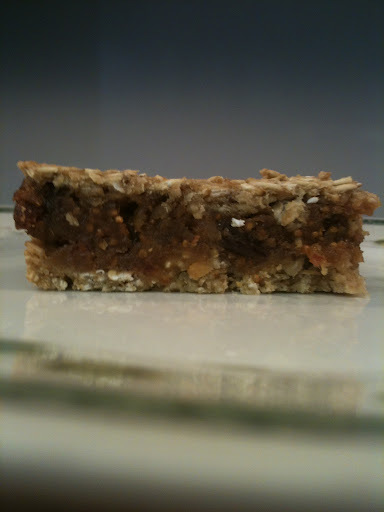 I used Multi-Seed Gluten Free Rice Thin Crackers by back to Nature. These were gluten free AND vegan! 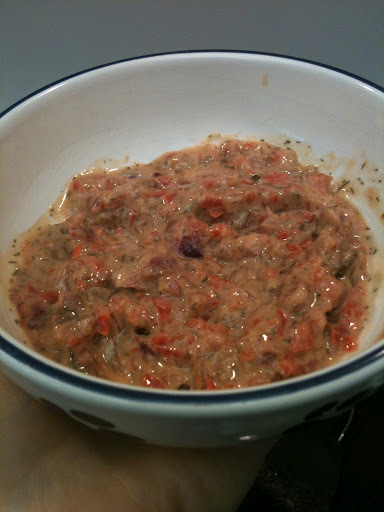 Directions: Combine all ingredients in a food processor and mix until smooth. This meal was very simple to make and to clean up afterwards. It was also very tasty. I will definitely be making this again. I might even double the recipe next time! 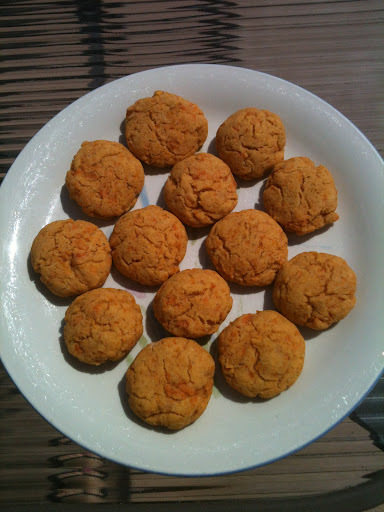 These bisquits make a great side or even a snack and were super easy to make. I ate one warm right after it came out of the oven and it was good. I also tried one warm with Earth Balance and that was also good. But I actually enjoyed these best the next day at room temperature even without Earth Balance. Cook the sweet potato until soft and mash it in a bowl. Add all other ingredients to the mashed sweet potato and mix together until a dough forms. Bake 12-15 minutes or until the tops are golden. I usually prefer to make my own pancakes, especially with all the different add-ins you can include to make traditional pancakes in a variety of ways with so much flavor. 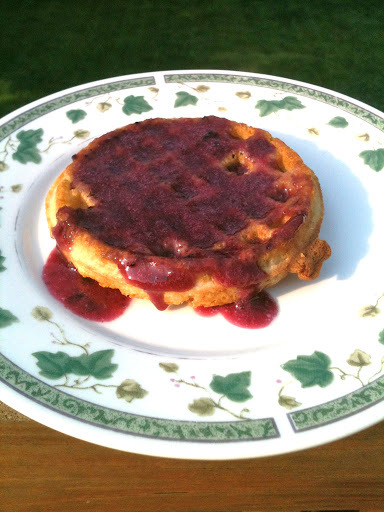 But I had one store bought blueberry waffle left that I thought would make a good breakfast one morning, plus I had some fresh blueberries from the Farmer’s Market that needed to be used. Instead of just adding some fresh blueberries to a blueberry waffle (the store bought kind does not have near enough blueberries for me) I had a great idea to make some blueberry syrup! 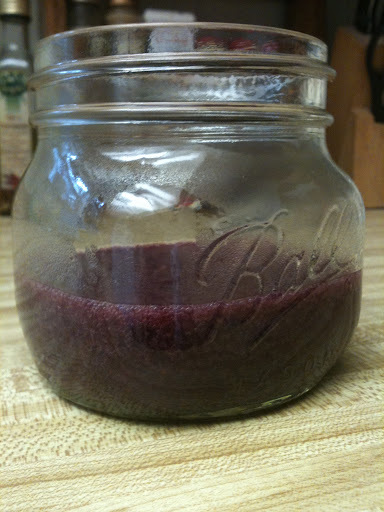 Pour the mixture into a small saucepan and heat over medium heat until bubbles begin to form. Slightly reduce the heat and continue to cook while whisking the entire time until the syrup becomes thick, about 3-5 minutes. This syrup tastes so fresh and would be great over waffles or pancakes, or even maybe a great topping for a muffin, cupcake, or ice cream! For dinner last night, I felt like I needed a good source of protein after a workout so decided to make black beans and rice. This is a pretty typical meal for me so I wanted to add something in to make it a little different. Looking in the fridge, I found some pineapple that needed to get used up and thought the combination of black beans and pinepple would give an interesting flavor and be perfect for this hot summer weather. The sweet pineapple definitely gave this meal a delicious kick. 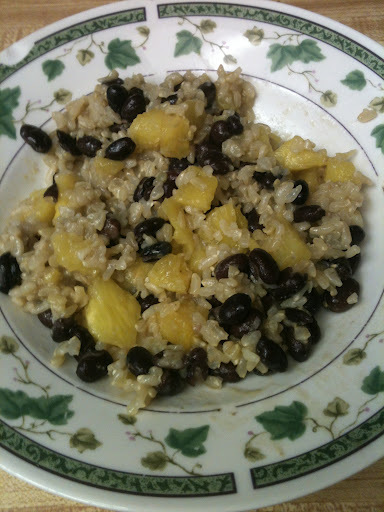 In a pan, saute the black beans and brown rice in pineapple juice over medium high heat. Once the pineapple juice is almost evaporated, add in the diced pineapple (you want it warm but not too soft). Continue to heat until the pineapple juice is completely evaporated. Add any seasonings if you want additional flavor. (I added some nutritional yeast). I really enjoyed this last minute meal and will definitely be making it again. Fig Newtons probably used to be one of my favorite snack foods. Since they contain wheat and milk I obviously no longer eat them and really miss them. I could always buy those expensive gluten free and vegan Fig Newtons, but they are not the healthiest snack option. 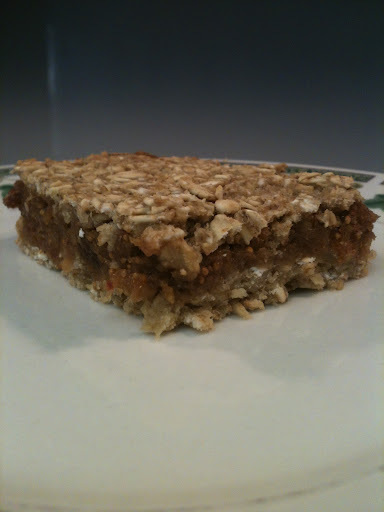 After researching online I came across a much healthier, tastier, less expensive option that’s fun to make! Blend dried figs, dates, and almonds in a food processor until a paste forms. Add agave, water, lemon juice, cinnamon, and ginger to the mixture and process until mixed. Set this mixture aside. Combine both the ground and unground oats, baking powder, and salt. Add in the applesauce, agave, and water and mix until thick. Press half the crust mixture into a greased 8×8″ pan. Spread the fig mixture evenly over the crust carefully with your hands. Bake for about 30 minutes, or until lightly browned on top. 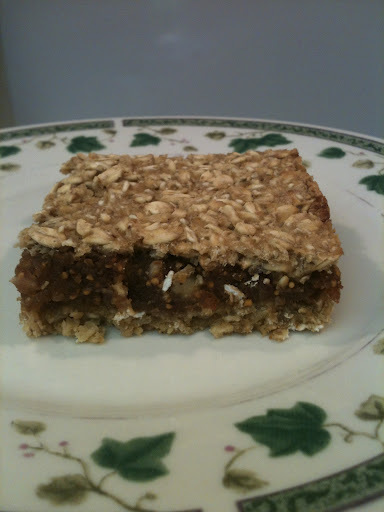 Since this was my first time making these Fig Newton Bars, I followed the recipe exactly as written. 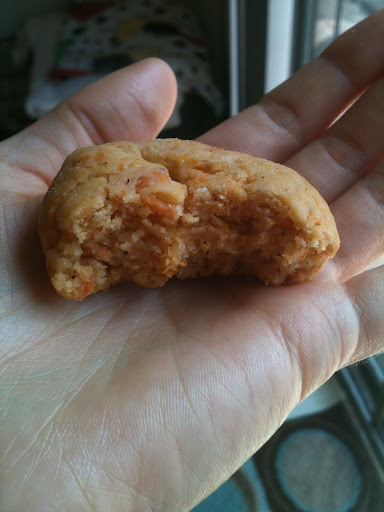 Next time, I think I’m going to try making them without the almonds, though I did love the flavor it added. 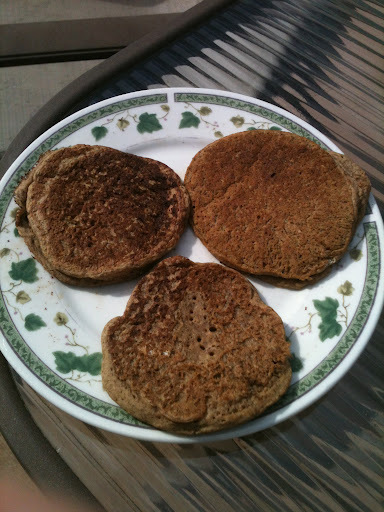 I have been hearing a lot about protein pancakes and they sounded like such a healthy and nutritious way to start this beautiful Sunday morning. I adapted this recipe from here. 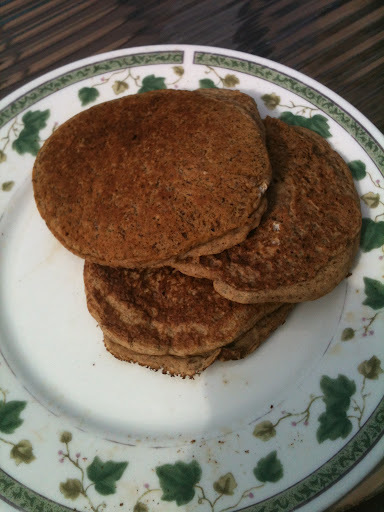 In a medium bowl, combine pancake mix, protein powder, baking powder, cinnamon, nutmeg, and sea salt. Add in wet ingredients (flax egg, almond milk, and vanilla). Whisk together until batter is smooth. This makes 3 small pancakes or 2 medium sized pancakes. Of course you can always double or triple the ingredients to make more!